Manuri Gunawardena, a Sri Lankan-born health tech entrepreneur in Australia, has been featured by the Forbes magazine in its latest ‘30 Under 30 Asia’ list. Her Sydney-based startup HealthMatch uses machine learning to sort through the thousands of clinical trials being run by contract research organisations (CROs) in Australia and matches registered patients that are relevant. Gunawardena was also featured as an honoree in the Healthcare and Science category. Gunawardena first thought about HealthMatch when she was working at the neuro-oncology laboratory of University of New South Wales as a medical student. While experiencing setbacks in finding patients to participate in clinical trials for potentially-lifesaving treatments, she also observedthat there was no convenient way for patients to search for substitute treatments for their conditions. That is when she founded HealthMatch and earlier this year, she launched her online platform in Australia. Talking about HealthMatch’s future plans, Gunawardena said that she was planning to raise at least $10 million later this year in a series A funding round that would boost expansion plans outside of Australia. “We are looking at expansion outside of Australia into Asia and the US. The first stop will likely be Hong Kong andSingapore. Both countries are big pharmaceutical research and development hubs for clinical trials. This will be followed by the US shortly after. There is also the chance we will do our series A fundraising later in 2019. We are hoping to raise at least $ 10 million to support our expansion plans,” said Gunawardena. Last year, HealthMatch successfully raised $ 1 million capital through seed venturing where the funding round included Sydney-based venture capital fund Tempus Partners, WhatsApp Head of Product Anton Borzov and Google’s Director of Intellectual Property and Litigation Catherine Lacavera. Gunawardena, with HealthMatch’sCo-Founder Arran Schlosberg, won the inaugural Australian TechCrunch Startup Battlefield event in 2017 where they took home the grand prize of $25,000 and an all-expenses-paid trip to San Francisco to pitch at TechCrunch’s flagship Disrupt SF 2018 event. 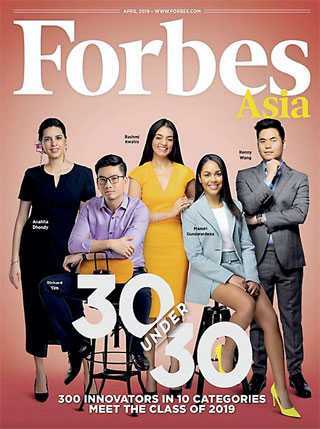 The Forbes ‘30 Under 30’ list features 300 young disruptors, innovators and entrepreneurs across Asia—all under the age of 30—who are challenging conventional wisdom and rewriting the rules for the next generation. The list includes 30 honorees in 10 categories—Arts (Art & Style, Food & Drink), Entertainment & Sports, Finance & Venture Capital, Media, Marketing & Advertising, Retail & Ecommerce, Enterprise Technology, Industry, Manufacturing & Energy, Healthcare & Science, Social Entrepreneurs and Consumer Technology.